CB Hatchel grew up with a passion for disassembling gadgets, learning how they work, and putting them back together to function even better. 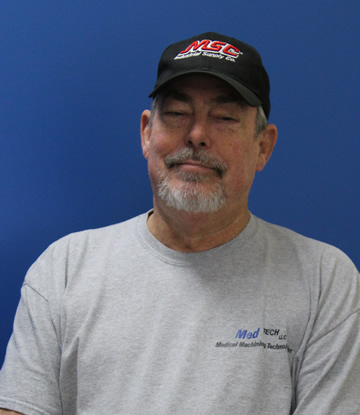 This inquisitive, mechanical quality has remained with him throughout his adult life and paved the way for him to be a mentor and possess a leadership role at Med TECH LLC. Brenda, CB’s wife, has always demonstrated remarkable organizational skills and excelled in every task she has taken on. She has fearlessly supported CB in all of his successful business ventures and has played an active role in them attaining the American Dream. Together they persevered and stayed motivated to better themselves while pursuing their ambition of owning another business together that could be centered on the machining expertise that their son possesses. A family owned and operated company was no stranger to the Hatchels, as they have owned various businesses from retail sales to machining engine components and other services in the automotive industry. So, when Jason and his wife, Teresa Hatchel, came to them with a business plan to start a Medical Device Manufacturing Facility using CNC Mills and Lathes, they jumped on the chance of owning the type of business they had always envisioned and they invested in their dream without hesitation. Med TECH LLC has surpassed expectations and grown into a well-known and trusted company by numerous businesses across the Mid-South and the country. That initial investment in 2004 has proven to be a very wise one for CB and Brenda Hatchel.